^ Frank Stenton, Anglo-Saxon England, 3rd ed. Oxford: Clarendon, 1971, ISBN 198217161, p. 386. ^ Stenton, p. 399: "It is with the departure of the Danish fleet and the meeting at Oxford which followed it that Cnut's effective reign begins". ^ Edward A. Freeman, The History of the Norman Conquest of England: Its Causes and its Results, Volume 1 Oxford: Clarendon, 1867, p. 404, note 1. ^ Jim Bradbury, The Routledge Companion to Medieval Warfare, London: Routledge, 2004, ISBN 0-415-22126-9, p. 125. ^ Philip J. Potter, Gothic Kings of Britain: The Lives of 31 Medieval Rulers, 1016-1399, Jefferson, North Carolina: McFarland, 2009, ISBN 978-0-7864-4038-2, p. 12. ^ Viggo Starcke, Denmark in World History, Philadelphia: University of Pennsylvania, 1962, p. 282. 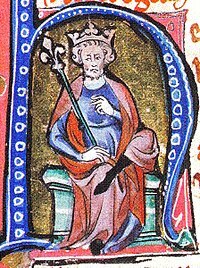 ^ In the probably later heading to a 1027 letter sent to his English subjects: Rex totius Angliæ et Denemarciæ et Norreganorum et partis Suanorum, "King of all England and Denmark and Norway and part of Sweden". Freeman, p. 479, note 2. ^ Karen Larsen, A History of Norway, Princeton, New Jersey: Princeton University, 1950, p. 104. ^ Brita Malmer, "The 1954 Rone Hoard and Some Comments on Styles and Inscriptions of Certain Scandinavian Coins from the Early Eleventh Century", in Coinage and History in the North Sea World, c. AD 500-1200: Essays in Honour of Marion Archibald, ed. Barrie Cook and Gareth Williams, Leiden: Brill, 2006, ISBN 90-04-14777-2, pp. 435-48, p. 443. ^ Franklin D. Scott, Sweden: The Nation's History, 2nd ed. Carbondale: Southern Illinois University, 1988, ISBN 0-8093-1489-4, pp. 25-26, listing Cnut's claim. ^ M.K. Lawson, Cnut: England's Viking King, Stroud: Tempus, 2004, ISBN 0-7524-2964-7, p. 103: "Cnut's power would seem in some sense to have extended into Wales". 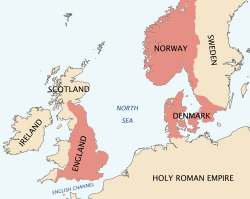 ^ Lauring, p. 56: "the Danes in England very quickly became Christians". ^ Stenton, pp. 396-97: "Swein . . . first appears in history as the leader of a heathen reaction . . . [but] behaved as at least a nominal Christian in later life. . . . Swein's tepid patronage of Christianity . . ."
^ Stenton, p. 397: "the first viking leader to be admitted into the civilized fraternity of Christian kings". ^ Jón Stefánsson, Denmark and Sweden: with Iceland and Finland, London: Unwin, 1916, OCLC 181662877, p. 11: "Cnut's ideal seems to have been an Anglo-Scandinavian Empire, of which England was to be the head and centre". ^ Lauring, p. 56: "He was fond of England and regarded it as his principle [sic] kingdom. . . . Canute actually became an Englishman". ^ Grueber and Keary, p. 6: "Though England had been conquered by the Dane she was really the centre of his Danish empire". ^ Jón Stefánsson, p. 11. ^ T.D. Kendrick, A History of the Vikings, New York: Scribner, 1930, repr. Mineola, New York: Dover, 2004, ISBN 0-486-43396-X, p. 125: "Danish taxes were introduced, Danish laws imposed, and preference was everywhere given to Danish interests". ^ Lauring, p. 57: "Now that a single king had assumed power after the pattern of Western Europe, the moment that king went away and omitted to leave strong men in charge behind him, or left a weak one, [the viking threat] became fatally weakened".